One of my favourite places to grab some lunch when I’m out with friends or family (if I can persuade them to try it!) is Yo Sushi. It doesn’t happen very often because it can be a little bit pricey and often people are put off at the thought of raw fish. But I wanted to share my last visit because I went with Josh and it was great. We usually go to a Yo Sushi restaurant but this time we stopped in the Bluewater Shopping Centre and there was a small Yo Sushi actually in the middle of one of the walk ways of the shopping centre. It was quite nice because you could look up and see the rest of the shopping centre – it had a kind of open air feel. I’m not the biggest fan of raw fish but I like prawns and tuna so thats a bit of a start! Josh had a pumpkin karoke, popcorn shrimp tempura and chicken firecracker rice. I also had popcorn shrimp tempura but had vegetable yakisoba and a plate of fresh fruit (melon, a strawberry, some grapes and some pineapple). Just to clear up a few of those names (for those who don’t know what they are) Pumpkin karoke is a bit like a potato croquette except flattened a bit, made with sweet pumpkin and fried in panko breadcrumbs. The shrimp tempura was a handful of little shrimps fried in a tempura batter and it came with a sweet miso glaze, its a brilliant mix of sweet, crispy, crunchy and soft – slightly more expensive but a firm favourite of mine – and they don’t skimp on the shrimp either. Chicken firecrackers rice is a slightly spicy chicken fried rice and vegetable yakisoba is a portion of vegetable noodles. 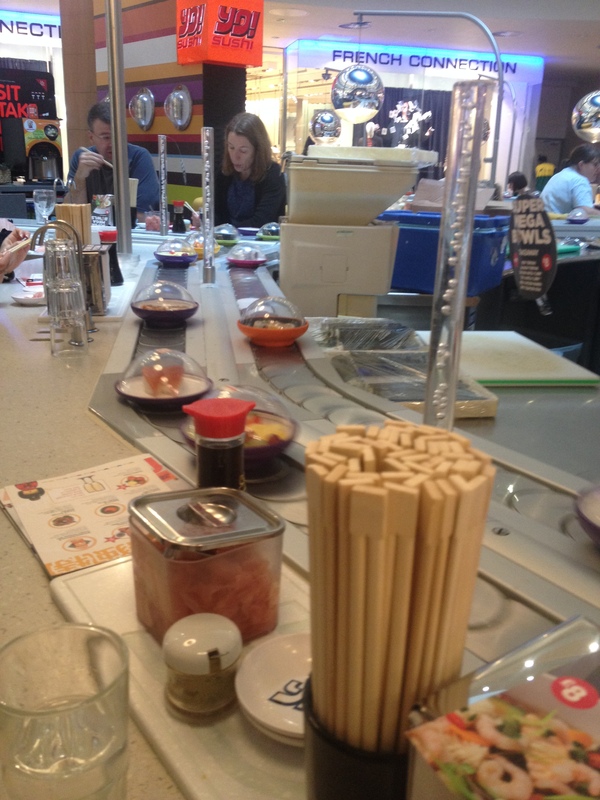 Yo Sushi has been a recent discovery for me – I wasn’t sure I would like it but once you’ve got your head round the lingo it’s not too bad! I even tried pickled ginger which was pretty adventurous for me! A lot of the nigiri (topping on top of the rice) and the sushi rolls (often rolled up in nori a type of seaweed) often contain raw fish and I’m not a fan. But Yo Sushi do have a few that I like. I didn’t have them this time but some of my favourites are Spicy Chicken Inside Out Roll and the Crunchy Prawn Inside Out Roll and these are all cooked. I think Yo Sushi has something for everyone, you can play it safe or be as adventurous as you like!